Severe acne usually does not clear out on its own, requiring the expert treatment of a dermatologist. Many people have experienced pimples on their skin that tend to clear up on their own or through the use of drugstore cleansers. 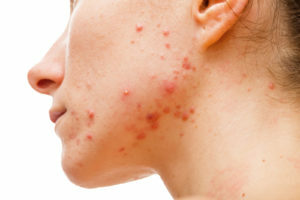 However, some people deal with severe acne, which consists of several inflamed, often painful, breakouts over the body. Severe acne can cause breakouts that extend deep into the skin and may leave scars once they are cleared. Severe acne can be stubborn and often does not clear on its own. Fortunately, our dermatologists at SCS Physicians offer a variety of treatments for severe acne and can help you find a treatment that works for your skin. To combat severe acne, your dermatologist will often prescribe antibiotics, which can reduce the redness and swelling of acne. You may also be prescribed a retinoid medication in addition to the antibiotics, depending on the severity of your acne. It is common for a dermatologist to prescribe a topical retinoid in addition to antibiotics. A topical retinoid is designed to reduce bacteria build-up and unclog pores, so they are effective at treating and reducing the appearance of your acne. They also can reduce the size of pores and have been used in anti-aging treatments. If you have a large and painful cyst, your dermatologist can use a few different techniques to remove it. Your dermatologist can inject the large cyst with a corticosteroid to reduce the size and pain. If medication does not treat your large painful cyst, then a dermatologist may make an incision to drain the cyst. There is also a procedure called acne extraction to remove whiteheads and blackheads that do not respond to treatment. Skin Care Specialty Physicians has been serving the residents of the greater Baltimore area for over ten years. From skin cancer screenings to treatments for hair loss, eczema, acne, and more, we treat conditions affecting your skin, hair, and nails. We diagnose a wide range of skin conditions each day and work with you to select treatment options that best fit you and your skin. We also offer variety of cosmetic treatments and procedures, ranging from Botox to microneedling, to fit you and your aesthetic goals. If you are interested in any of our services, contact us at 410.252.9090. You can also follow SCS Physicians on Facebook & Twitter. This entry was posted on Friday, December 7th, 2018 at 1:54 pm. Both comments and pings are currently closed.